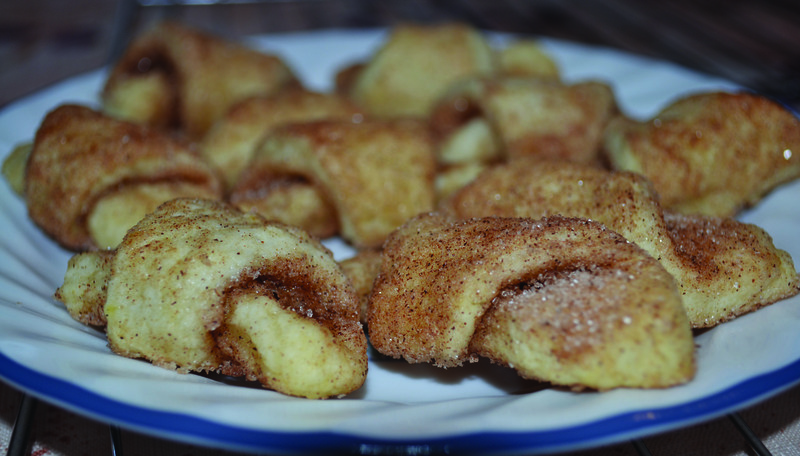 As part of my Christmas baking series, today I’m sharing a recipe for Cinnamon Rollups. 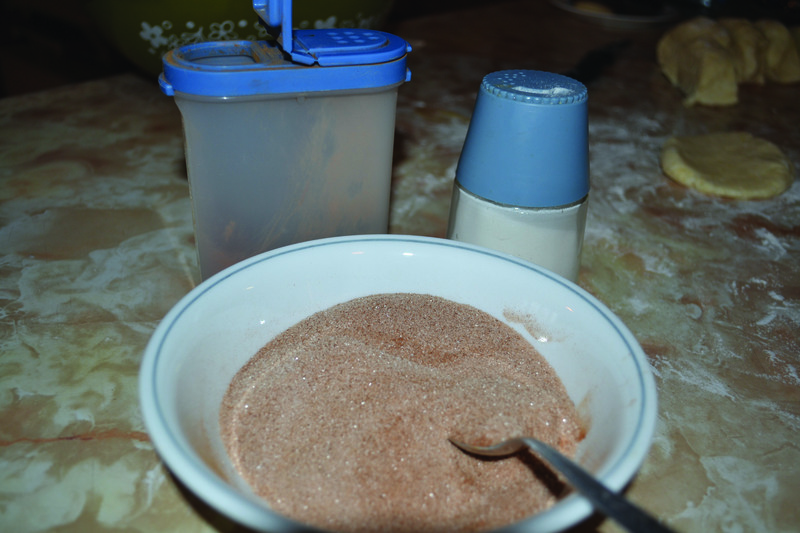 These have a nice subtle cinnamon taste, are not too sweet, and are easy and quick to make. Combine flour and baking powder, cut in margarine until crumbly. Stir in milk and egg. 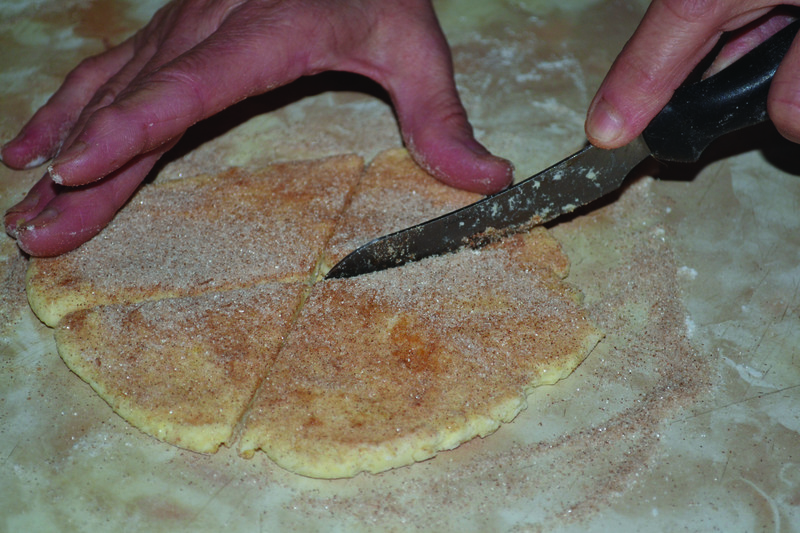 Combine sugar and cinnamon, sprinkle onto counter and roll out your dough so that the cinnamon and sugar covers both sides. 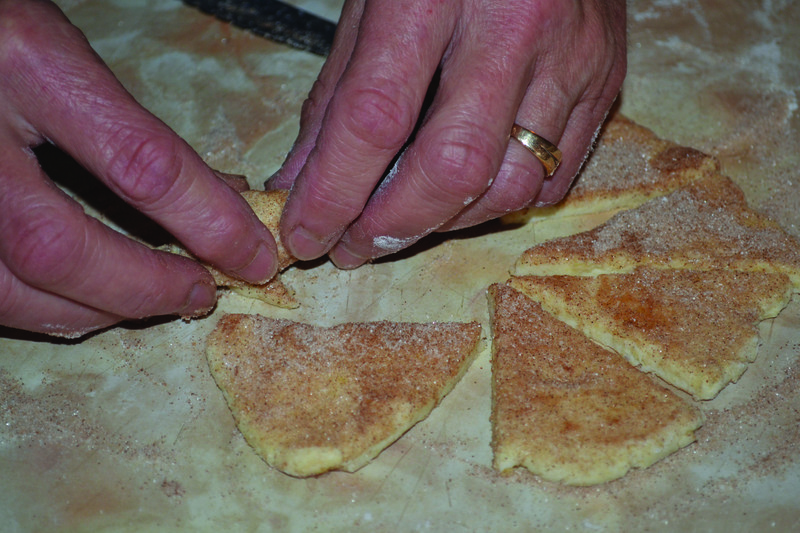 Roll out dough into a small circle, cut into wedges and roll up each triangle. You should be able to roll out about six small circles, cutting each into about eight wedges, making a total of about 48 rollups varying in size. Bake on a cookie sheet at 350 F for 16 to 18 minutes. 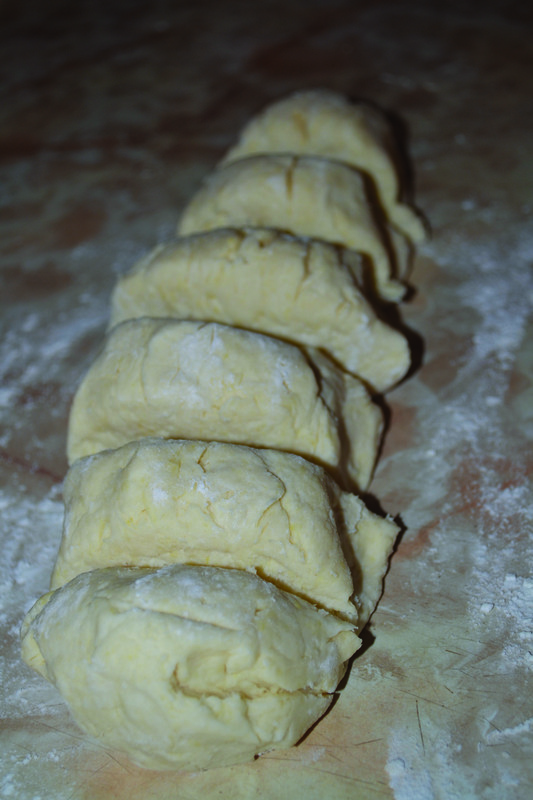 Cut the dough into six portions to be rolled out into small circles. 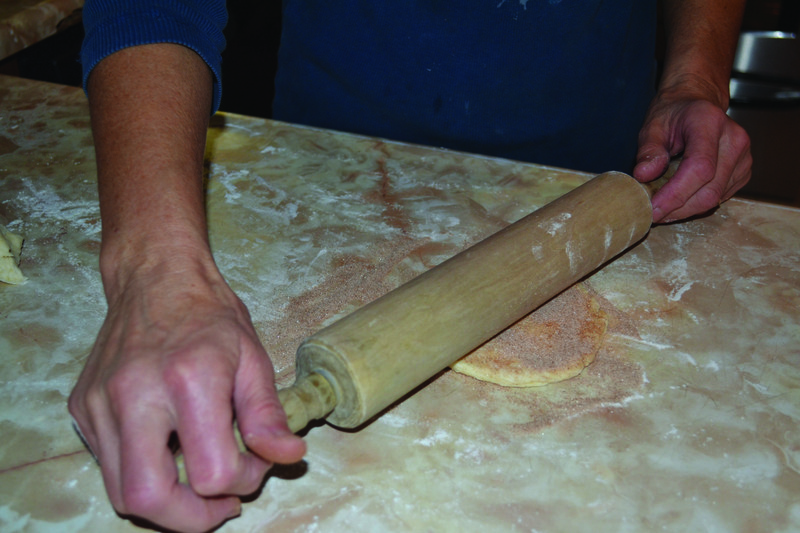 Rolling out the dough into a small circle. Make sure both sides are covered in the cinnamon sugar mixture. Cutting the small circle of dough into wedges like a pie. 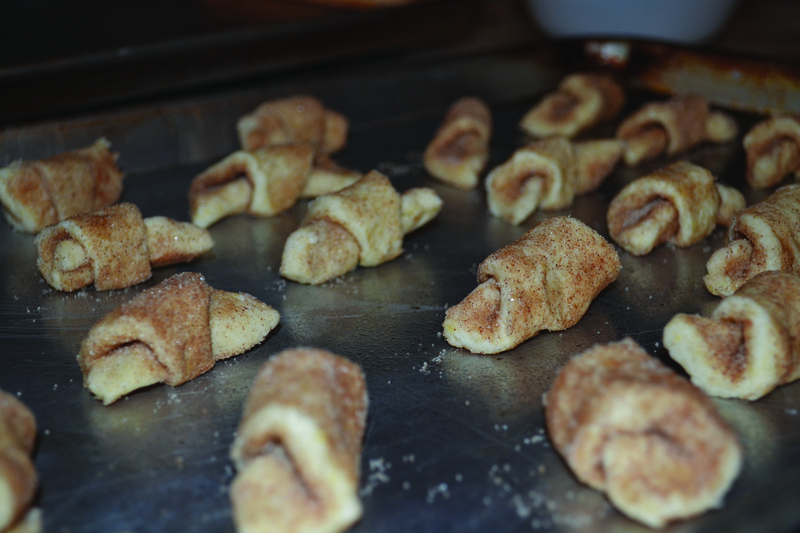 Cinnamon rollups ready for the oven. 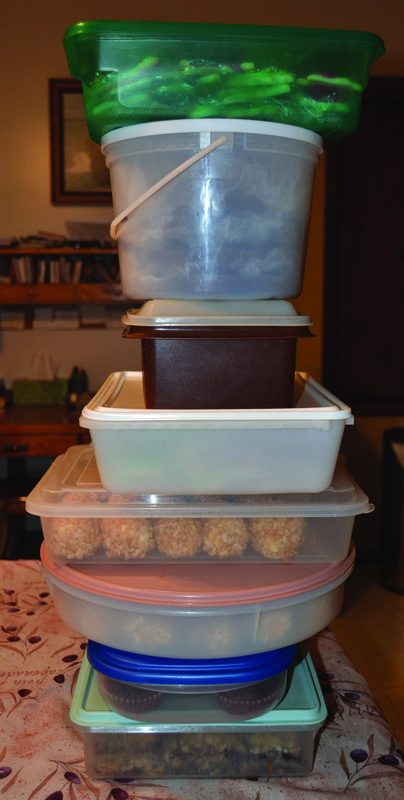 Our impressive stack of baking in containers! All in a day's work! These look yummy. Wish I could have 1…or 2….or just 3 right about now. Thanks for reading! The recipes on your website look amazing. I’ll have to try some of them. Wow – going to try these … maybe right now!! Is it bad to have them for dinner? I’ve never made cinnamon rolls (or round ups) but you made it look so easy – thanks! Thanks for stopping by my blog, Sarah! Yes, these cinnamon roll ups are very easy and quick to make. And they’re always one of the first treats to go when I bring a variety of baking anywhere. And I’m sure they’d make a wonderful dinner! The peanut butter cookies are tasty as well. The rosebud is a nice added touch.